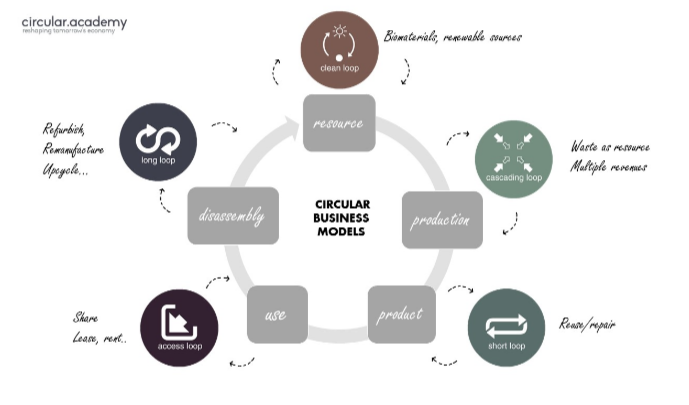 Home Post	What are Circular business models actually, and what types do you have? possible. The business models are ultimately the driving force behind the creation of the circular feedback loops. A. Circular input models: These business models focus on the creation of raw materials and inputs that fit the circular economy: fully renewable fuels and the production of biodegradable and recyclable inputs. The revenue model consists of alternative raw materials being more affordable or better than traditional raw materials. B. Waste value models: Recycling and upcycling play a crucial role in these models. By creating a market for waste, a revenue model is realized: a cost item that turns into a profitable company. This can result in waste from a production process being worth some as a raw material for another production process. This model is useful for companies that have large waste streams, or for companies whose residual waste products can be processed into new raw materials. C. Lifespan models: Extending the lifespan is possible in a number of ways: repair, upgrading, remanufacturing, or re-marketing the same product. The earnings model has a number of sides. Partly it is in services (repair, replacement, adjustment), partly the fact that the (residual) value is once again used commercially (as with resale). D. Platform models: An important way to make better use of equipment is to make goods that are not used available to others. This can be done from consumer to consumer on a temporary basis and whether or not for a fee (partial models), by renting services through which existing goods are used (on-demand and on-call economy), or by allowing items that are no longer used to be changed. (second-hand market). The revenue model sometimes consists of the intermediary function (bringing together supply and demand against payment), sometimes from the residual value of the goods, sometimes from offering (new) services to make better use of existing goods. E. Product-as- service models: Instead of selling goods, the company remains the owner of the product. It is made available to one or more users, or by a lease contract, or by a rental price per use. Alternatives can be thought of here.